The environment of the salt pans is stark, vast and harsh for the communities of people who live there harvesting salt for most of the year. In 2014 one young girl, Pauna, who is about 19, asked how my skin could be soft and smooth when hers was so blemished and damaged. It was a startling and revealing comment as I am more than old enough to be her mother, but not quite her grandmother. In her Gujarati language she asked me about cream; at the end of our art project conducted in the 30+ degree heat, sun and sand, I handed over all my sunscreen, moisturiser and handcream with translated instructions about how sunscreen works. The conversation stayed with me. In other situations, sunscreen would be seen as essential to worker safety and issued to everyone working in direct sunlight and in temperatures up to 50 degrees. Not for the saltpan workers. Sunscreen is relatively expensive in India, and out of the reach of these people who earn 28 rupees per 100 kgs of salt (that is, about fifty cents). Their faces age prematurely. Workers also suffer eye damage and blindness from the intense reflected light from the water and salt. When we left the community in early 2014, we decided to bring more sunscreen and moisturizer when next we visited. After the MAKE DO TELL crowdsourcing campaign finished we received extra donations from friends and some of this was set aside for sunscreen. In Ahemdabad, we bought all the sunscreen one shop had in its supply! As soon as we arrived in Zainabad where we stay, we heard how the women’s skin had improved because of the cream that I left with them. When we arrived at the saltpan family’s home, we discovered they had used the cream so sparingly that they still had some left …. after ten months. Lots of the talk between the saltpan women, girls and us was cream cream cream! On the last day of the project we handed the sunscreen and moisturisers over to Pauna and her sister Ettel to distribute amongst the wider community. The excitement was palpable. 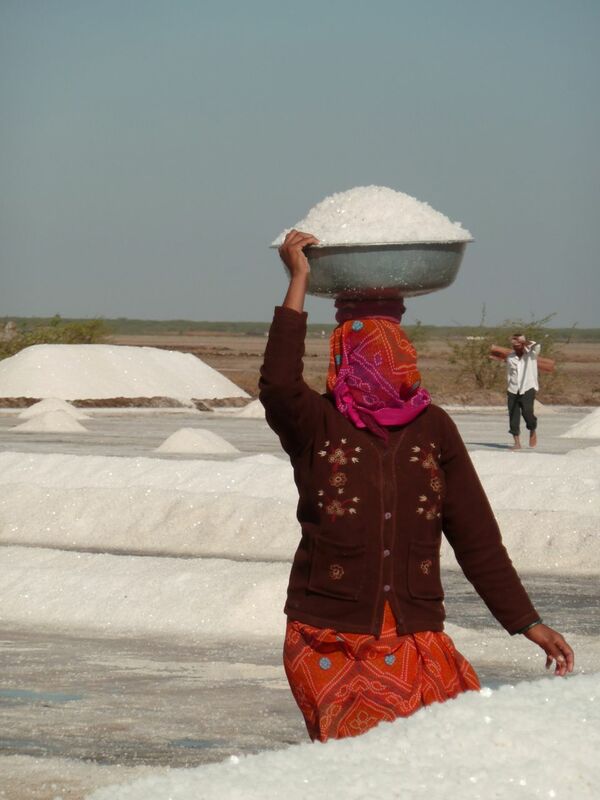 Many people, including our supporters, have been touched by our stories of the salt pan communities. It’s been quite easy to provide a solution to this problem because people have got behind us and made it happen. Skin damage begins early for some. Women shield their faces from the harsh light and sun with scarves and veils, but this is not enough protection. We also thank our many supporters, including Desert Coursers and MGIS, for providing funds to make this project possible. Artists in Community International donate our time and some costs to the project.